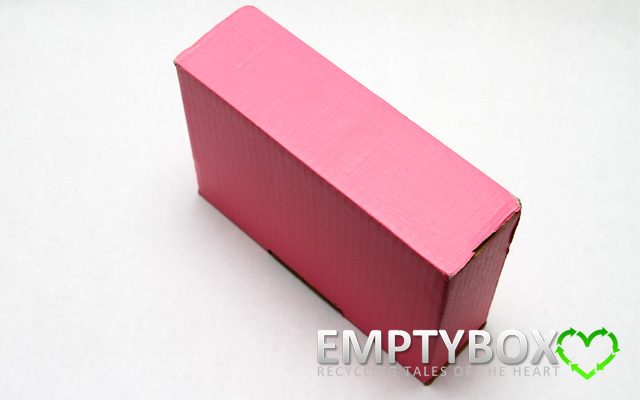 It arrives in a PINK rectangular cardboard delivery box. SO pretty. 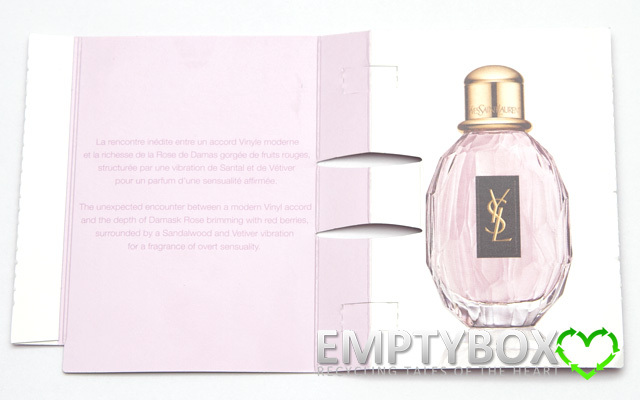 It's sealed with a sticker mailing label attached over the opening, like the Luxe Box delivery packaging was. 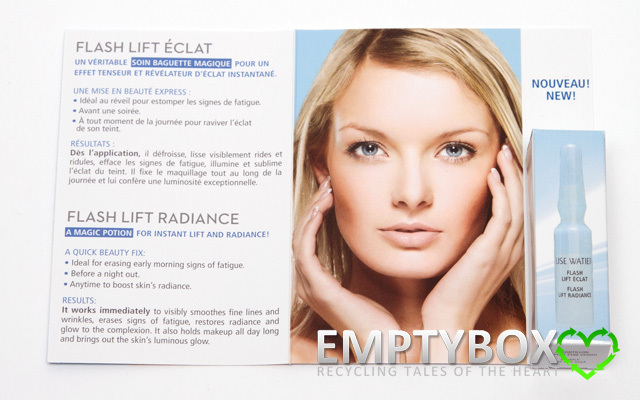 Like the other two sample boxes, the delivery method used is CanadaPost, with tracking. 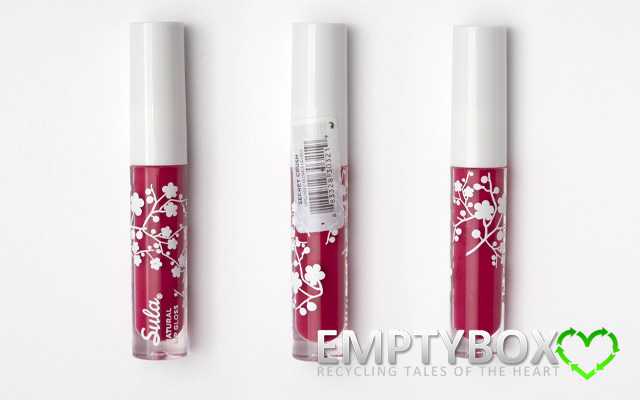 It is the only one out of the three boxes where the sticker label indicated FRAGILE on it. 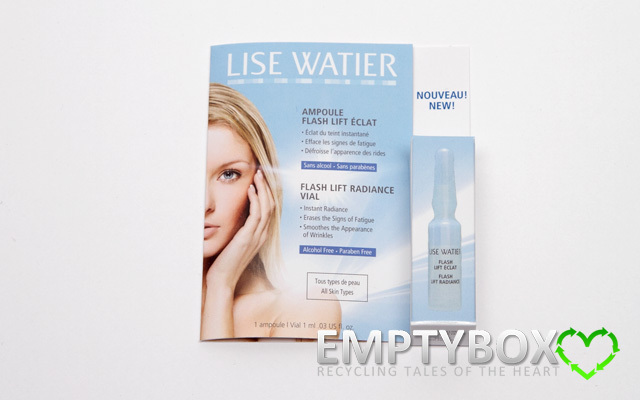 I like that they care enough about the contents to include that. 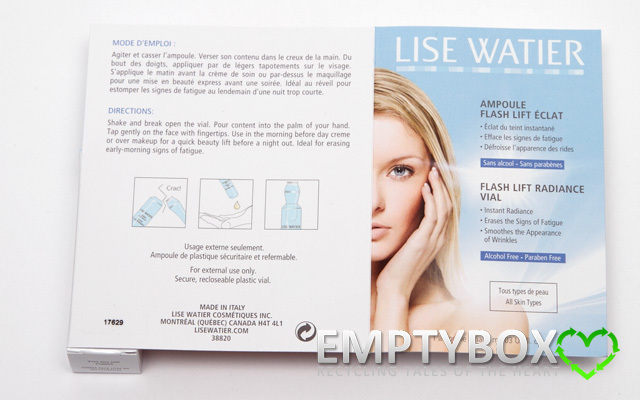 It a flip open lid where there is no branding on the box itself. 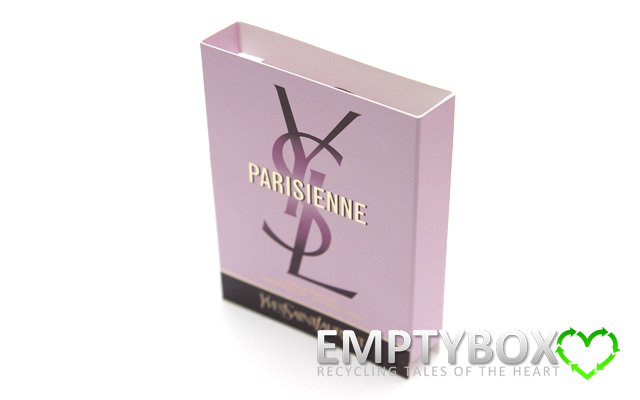 Sort of neat that they don't need the name on the box to tell you who it's from, just the colour of the box says it all. Inside the delivery box contains another box. 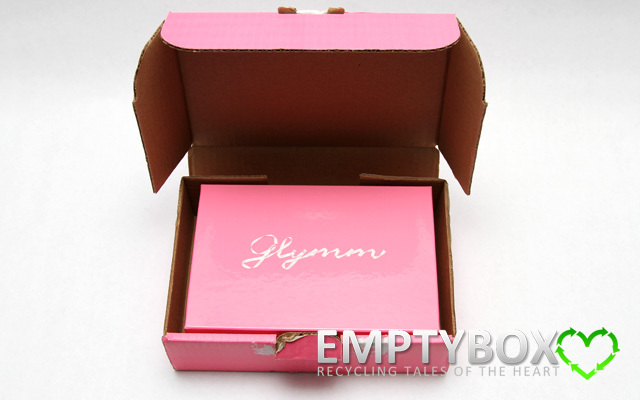 It is a glossy pink rectangular box with the name Glymm on the top lid. 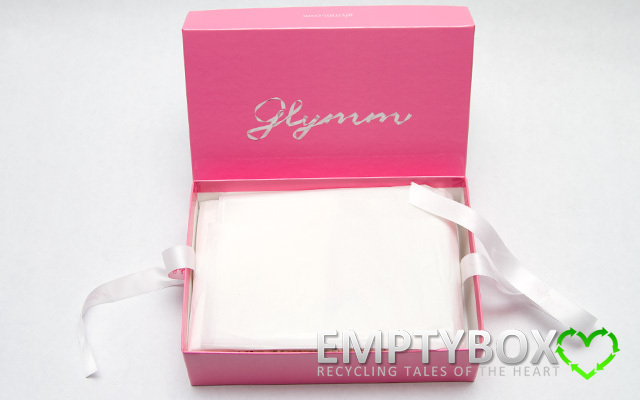 It's really cute that the spelling of Glymm is made to look like it's done with white ribbon. 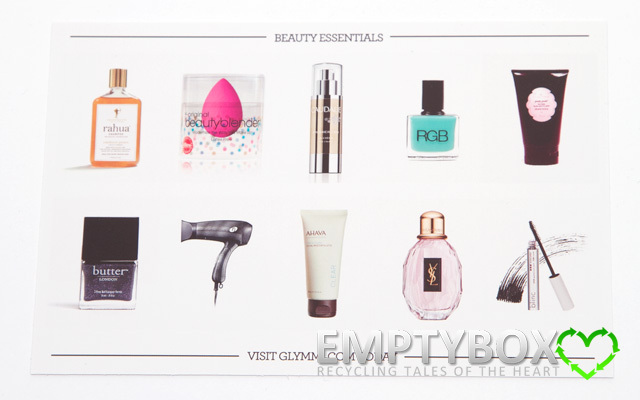 Glymm is just so feminine and girly! 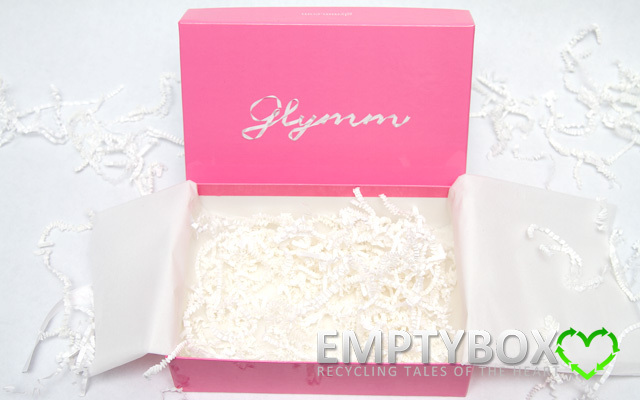 The items come tied together with a white ribbon, with pink Glymm writing all over it. 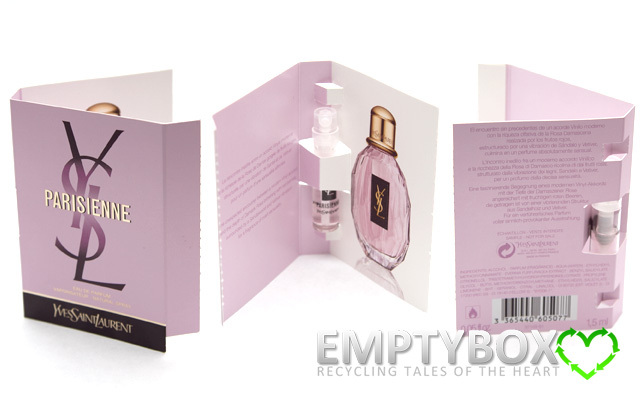 Once the cards are removed, you see that the items come wrapped in white tissue paper. The items themselves lie in a bed of crinkled white paper strips. It's super cute that instead of using a sticker secure the tissue paper contents, they took the time to tie a cute little bow with the ribbon instead. It absolutely just adds to the whole pretty/girly theme they have going on. 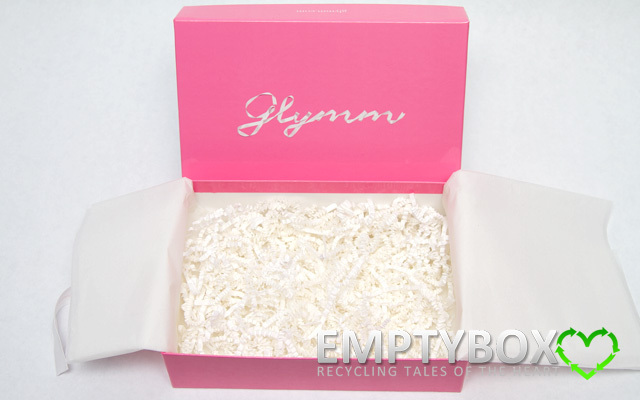 The bottom of the box is filled with white crinkled paper strips. 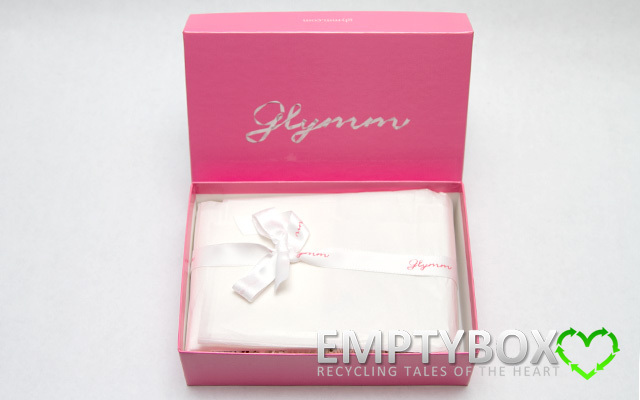 Everything was wrapped in the white tissue paper and white ribbon with pink Glymm on it. 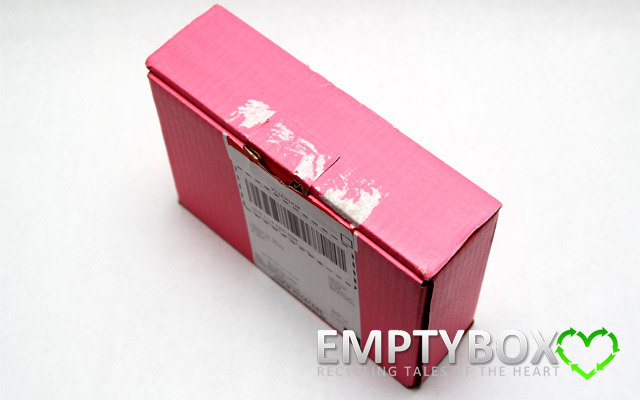 The outside box is pink, while the inside is white. 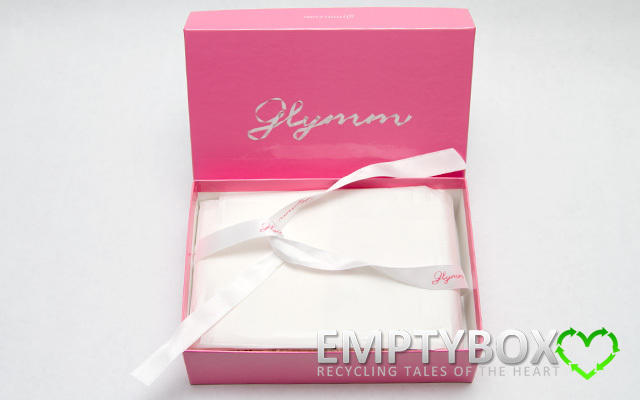 Glymm definitely has the girly pink and white theme going on! 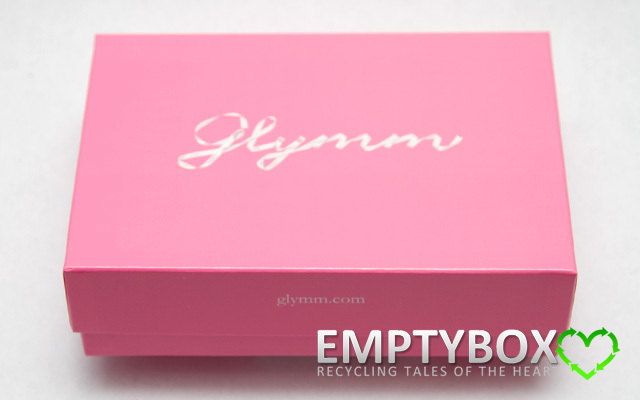 My last December sample box subscription, Glymm finally arrived! So excited! Speed of delivery was still pretty good from the time they sent out the shipping notification. 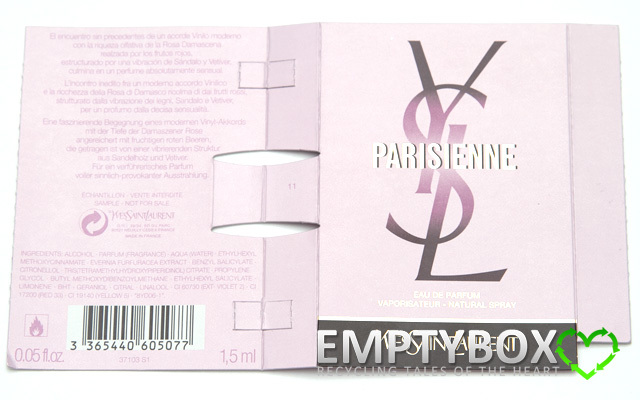 I suppose their batch of sample boxes get delivered later in the month than Topbox and Luxe Box does. 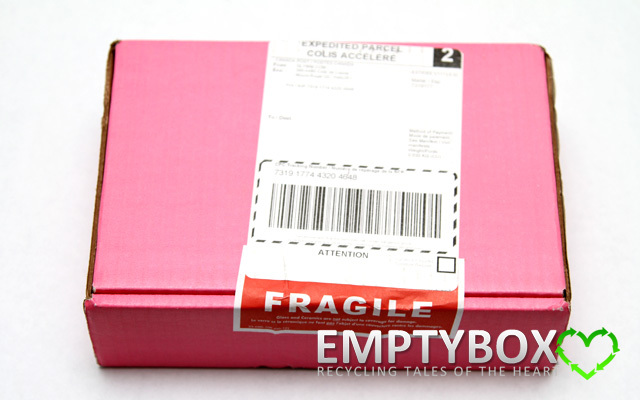 At least the delivery packaging was just SO pretty in pink. I love it! 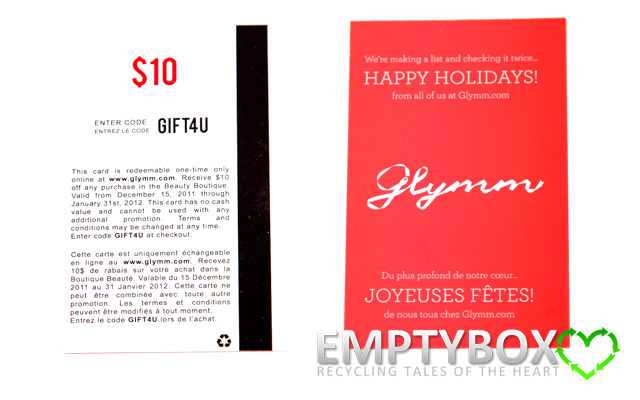 With the December 2011 Glymm samples itself, I was pretty happy with the products. 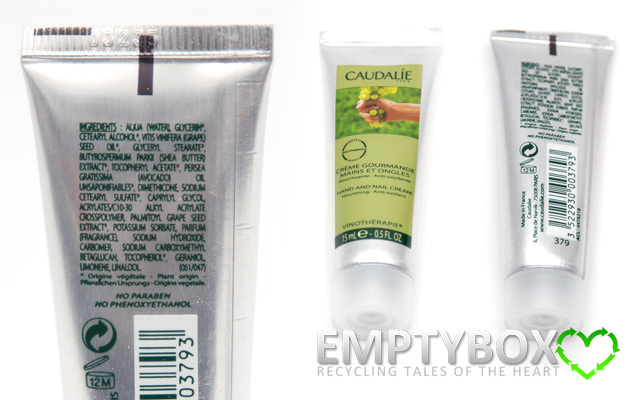 They had a good mixture of products, for hands, body, face and lips. A little disappointed because I was really hoping for a nail polish, but that's just me since I LOVE nail polish. The Butter London nail polishes they have on their website was quite tempting for me, though i held out on buying it hoping one would be included in the box, but oh well, c'est la vie... 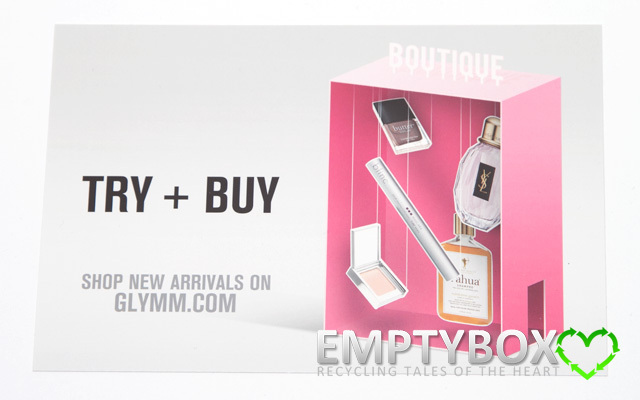 Looking at what others received in their Glymm box, I found that Glymm's samples varied a bit more than Topbox and Luxe Box did. 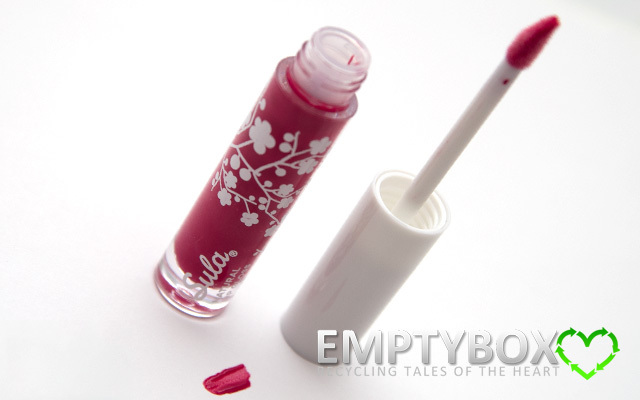 Glymm did not go by exactly what their description card listed. 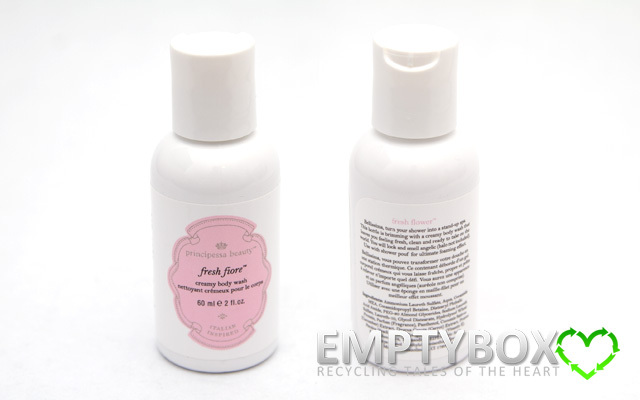 For example, it listed that my box should have contained an Ahava Mineral Hand Cream but I received the Principessa Beauty Fresh Fiore Creamy Body Wash instead. I'm fine with the substitution, but can you imagine if i got something i really didn't want? I would've been a bit peeved. I lucked out though, so all is well. 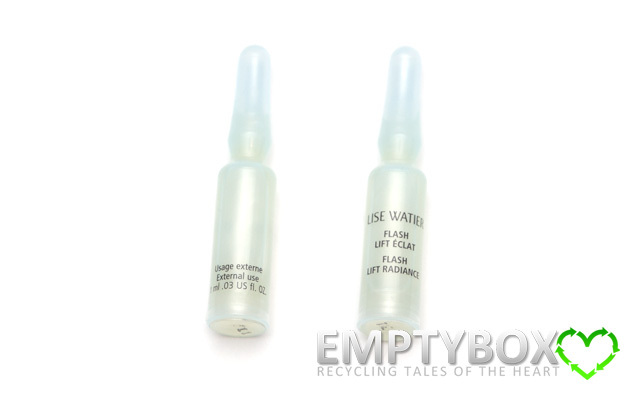 As well, I see that I received a regular size perfume vial, whereas others have received the deluxe size samples, which are a bit bigger and come in the pretty miniature version of the perfume bottle. Other than these slight variations, pretty satisfied with how Glymm turned out. 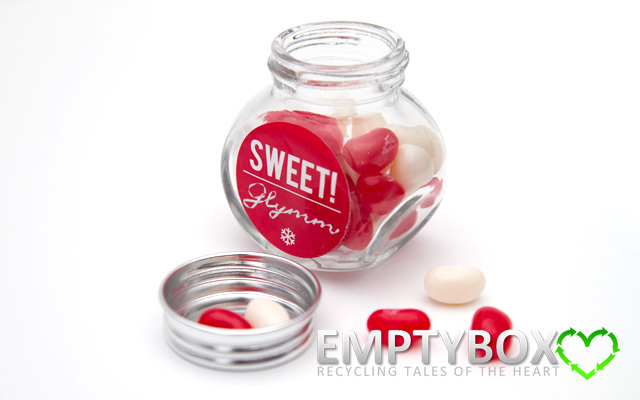 What I do really like about Glymm is that they add the special touch of including the Sweet! jar. 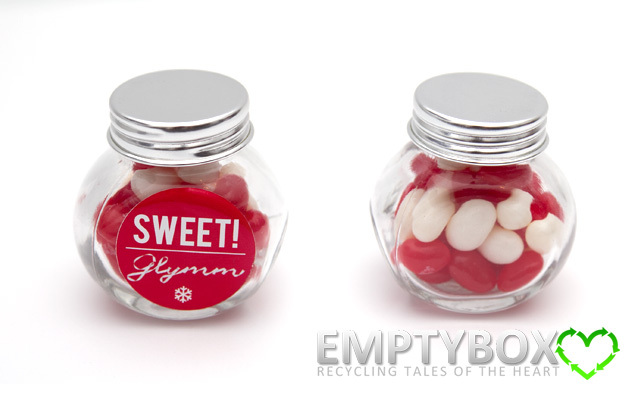 The jar itself is really cute with the way it's dimpled for your thumb to hold it. 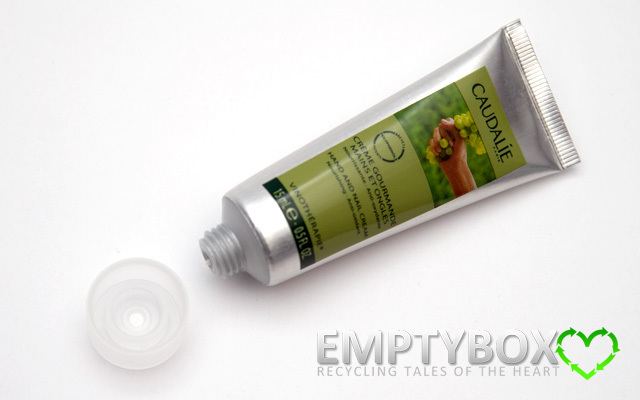 Nice jar to reuse, although it's a little tough to open. When I originally saw it online, i assumed it was just filled with regular generic jelly beans. What a surprise it was to discover that it's actually Jelly Belly's that's included. They are so yummy with their creative flavours and that's why i couldn't help myself by eating them and losing count of how many were exactly in there. Sorry!